I’ve been working with a super minimal Arduino setup recently. After seeing Alex’s awesome Arduino/ATmega breadboard header, where he notes there’s no room on the PCB for pin labeling, I wondered if it would be possible to make a small sticker that goes on the ATmega chip, labeling the pin names. This was created by printing on a full-page sticker then laser cutting it to shape. I could have also just cut out the sticker with scissors, or used regular printer paper and double-sided tape. – arduino-atmega-sticker.eps — EPS of just the sticker itself. – arduino-atmega-sticker-lasercut.cdr — Coreldraw file containing instructions & registration marks for printing then laser cutting your own sticker. Great, thanks. Just printed them out on plain paper, cutting them with a scissor and sticked it to the Atmega with some Glue. Comes in very handy! Brilliant Idea Tod! May I suggest including multiple copies of the image on the same page? It may save some paper, and in all likelihood, people would need more than one. Haha, dor, yeah. After I finished making it, I realized “huh, I should’ve just used scissors”. But ended up using this sticker idea as a way of lining up the output from a printer with the laser cutter. Nice! 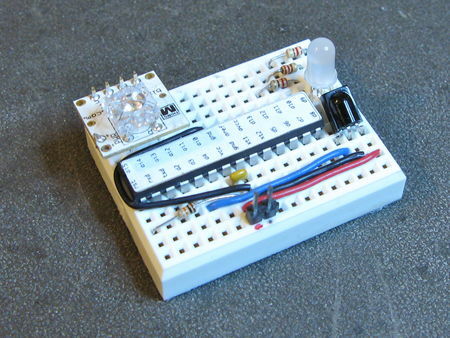 Looks like a much sturdier implementation of a minimal Arduino than anything I’ve done. Plus, adding the reset button and FTDI serial header makes it a *lot* easier to use I bet. Sometimes the coolest ideas are the simplest ones. As in, “Why didn’t I think of that?” Thanks, Tod!